I lost almost all of my old Lego sets (dated 1987-1996) but recently I got into collecting new Lego sets, mostly City and Minifigs. I remembered Lego as an ultra high-quality toy, but you know, grass was also greener back then. Nowadays I'm observing some quality issues. For example - loose hats, seats that can barely hold a minifig, different color shades of the same bricks in one set, etc. I'm not able to compare the quality, how it changed thru the years, but maybe someone who's been steadily collecting sets can tell something more? My observations are - set from 2007-2009 are the most problematic ones. Most recent sets, like the 3366 Satellite Van, are pretty good. Another thing - I'm a bit concerned about possible discoloration after long and steady exposure to daylight (not direct sunlight however). Currently I keep most of my sets crammed in a dark cabinet but I was hoping to put them on a nice display. I'm a pure collector, I just build the sets and don't really play with them (I also do some photos from time to time). Have any of you observed a significant discoloration or other bad things happening after several months? And if so, than how long did it take you to notice that? The Lego Group has always had a focus on brick quality. I think this was most evIdent in years past because while Lego was using the same high quality ABS plastic, it's competitors were not. Thus, Lego bricks distinguished themselves by not readily breaking, cracking, chipping, and fitting loosely. Nowadays, I find that building toy serious about competing with Lego has improved their quality as well. An interesting piece of trivia I heard recently was that ~16 bricks out of 1 million are rejected during manufacturing; those are pretty rigorous standards. With respect to your observation about 2007-2009 sets, I personally have not noticed an inordinate number of defects. One thing is certain---sets with components made in China,such as the CMs and Kingdom battlepacks feature CLEARLY inferior parts, such as hands and torsos. I think it's just going to get worse if TLC wants to cut cost by producing in China. An interesting piece of trivia I heard recently was that ~16 bricks out of 1 million are rejected during manufacturing; those are pretty rigorous standards. I think LEGO are torn - they're trying to rapidly increase capacity in order to meet increased demand, and it may be having some effects on quality. I don't doubt that they're trying to address the issues, however. I'm not talking about the Minifigs, although the 3. and 4. Series are quite good. I've got some cars and other vehicles, and the seats in some of them just can't hold the minifig. The pieces look good, plastic is good, but it seems like something is a bit miscallibrated. Also - in my LEGO City Truck [the yellow one] yellow panels that build the trailer have different shades. Same things happen in a lot of new sets. Even in a brand new set, some pieces interlock tightly, some just barely. I first have to say that all the new detail in the pieces including the new colors and new painted details on the back of the figures is really beautiful. I love the new stuff, But..
One of the biggest things that people first talk about when they talk to other parents is how much it hurts to step on the darn things. Well with this design, you can't do that..
You first talk about how they hurt you.. the old ones.. but with their new design, they don't hurt as much... which is like talking about almost anything else from cars to washing machines.. you used to be able to fix them when they were durable goods, now they make them so they are better, faster, lighter, etc.. but when they break you have to throw them away..
Lego Bricks are not getting that way... yes they can break... they used to be nearly indestructible, a 300lb person could step on them and it would hurt... now they just bend.. then you need to bend them back.. which creates a small defect on them. Don't know what I am talking about? Compare a Lego Medieval sword from 1990 to a sword made now.. it may be the same plastic but the atoms are not as dense as they used to be.. If I wanted to buy a third party brick replica I would, but I am want the old hard plastic bricks that last forever..
^Actually, the swords are different plastic. 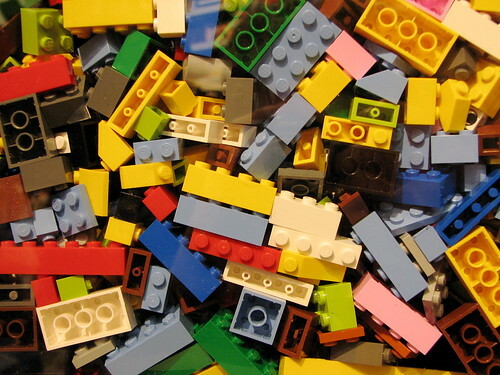 Regular LEGO bricks use ABS plastic. From 1978 to 1993 the swords were made out of the same ABS plastic. In 1994, LEGO started to use Polypropylene (PP) plastic to make these swords. They did it because people complained that the ABS swords were breaking and PP swords are more flexible avoiding this issue. I'm only 17, but I feel I do have a fairly decent knowledge of the older pieces, as my parents were smart enough to purchase a large quantity of 80's Lego well before I old enough to play with them. I noticed and agree that the sets between 07-09 are the odd ones, my $400 Grand Carousel had a number of the small more common bricks that just felt odd. Granted it's only because I've been collecting Lego for as long as I can remember that I was able to pick this up, but for the price I paid I wanted top quality. The same went for the Shuttle Adventure I have just invested in, some pieces seem loose compared to others, though again, only the experienced Lego-ist would notice. I do understand that they need to cut corners somewhere, but cutting corners on their top-of-line sets, is not cool. Some sets I've bought new (and this includes a few from the 1980s and 1990s) I've had a few problems with. Sometimes pieces just refuse to stay attached. I've had particular problems with the wrecked boat in Pirates Perilous Pitfall, the archways in 6277 (Imperial trading post) and the prison pod holder on the back of the submarine in that Aquazone base (the one with that big green half-dome). Not to mention the foundations of the buildings in that recent modular pirates Imperial outpost set. I've had to blu-tack a few pieces to keep them attached in a few sets (like the webbed radar dishes in that light-and-sound Multi-Module Transport). I don't know why this kind of thing happens. It never happens with old or second-hand pieces. Cracking. I too still have heaps of my 80's bricks along with memories of years of play - and infinite durability. Now that I am 36 and buying contemporary sets for my young ones, I am finding a surprising amount of bricks that have cracks (on sides that are stressed during clutching) only after minutes of play. I first thought it was afflicting white bricks, but I have since discovered (and quarantined) other colors. Sure LEGO will replace them (no questions), but I am shocked to see cracks in the first place. Quality's been dropping for a while, but more markedly since about 2006. LEGO's packaging dropped in quality in roughly the 2000-2003 ballpark. Loss of flip-up lids, and manuals that started getting crumpled. This has gotten steadily worse, although current sets (starting 2011) with 1000+ pieces have been fixed with shrink-wrapped instructions. LEGO's coloring started experiencing SOME problems in 2004 with color variation, and has increasingly had problems since they switched to color-injection methods with their ABS molding, and since they started using Chinese production. Tolerance standards have been spotted since roughly 2003 (older elements appear to be more consistent), but it's petty minor. There's also been element cracking issues since around 2003, and getting increasingly pronounced in more recent years. They're still way better than MegaBloks, but no, it's not your imagination-- LEGO's been dropping quality. Some of that's thanks to the change in upper management in 2005, knowingly changing their procedures so that quality is more likely to degrade, in an effort to keep the company from going out of business. I believe elements from 1998 and before seem to be pretty top-notch, and probably even elements from 1999-2002. Basically, LEGO has the chemical Bromine in it in order to reduce its flammability (safety issue for kids). And when UV light hits it, it has a chance to break its bonds and start to appear color-wise as a yellowy brown. Retr0Bright is a chemical compound you can make that helps to reverse the process (re-bond the Bromine correctly to the plastic, not to itself), with the help of MORE exposure to UV light. they need to stop making the stuff in china, for some reason.. everything there seems to be made in really poor quality. If Lego is starting to go that way, then maybe it is my time to stop buying them.. I love them, but not if what I love about them is no longer there..
Move your factories to the U.S.A we will work for cheap labor...we need jobs..so we can buy more lego bricks.. I DO NOT SUPPORT CHINA PRODUCTS. IT takes away jobs and makes everything cheaper.. LEGO YOU JUST LOT ANOTHER ONE.. ME.. I'm now going to buy few New in Sealed Box sets from mid 90's, smaller ones because I'm going to open the boxes and investigate the pieces and overall quality. In terms of quality, the worst set that I have is 3181 Passenger Plane. There is basically no "clutch force" on the seats and several other parts, minifigs are rather loose, color differences, some parts barely fit into the gaps intended for them. I observed same problems in my 3221 LEGO City Truck - loose caps, loose seats, one minifig has loose hand, in some place you have to bend the construction to put everything together. And yes - Minifigures Series 1 are quite cheap. I came as far as thinking that I've bought some fakes or lower quality sets sold to the market chains since I bought both sets, at the same day, same sale in an Auchan market [large european chain] where they were really cheap [below MSRP, around price that you'd get on the wholesale market]. But then again, you can get them at similar prices in other places and I wouldn't suspect a large corporation selling counterfeit products and it would be hard to believe that TLG has been secretely sorting and selling lower quality products. Sets that I've bought recently, especially 3366 [Satellite Launch Pad], 2516 [Ninja Training Outpost] seem pretty solid, but still I think the red bricks look cheaper than "ong time ago". 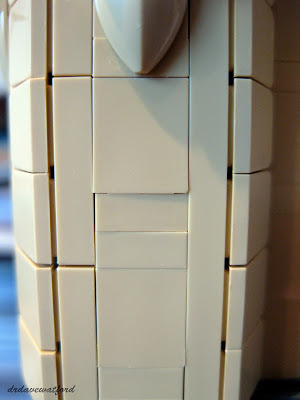 Also, I don't remember LEGO pieces having visible mould injection marks back then. But, my Dark Ages lasted quite a bit of time - since 1997 [when I was 13] to 2009. I had massive interest in LEGO but my collection hasn't been large. I used to turn every problem into a challenge or a story, so if my minifig had a loose arms or was missing a leg, it didn't bother me that much. I've always found problems with some Lego pieces so I don't find problems today as much different. I notoriously recall 1982's 6890 Cosmic Cruiser having multiple problems including the landing gear not sticking. You'd lift the model and the pieces would just fall off without even being bumped. It might as well have had no studs on the top for all the connectivity it possessed. The hinge piece in the back did not line the top and bottom studs perfectly resulting it it being off-center so that when you lowered it to secure the smaller ship into the larger, the hinged 3x2 didn't extend far enough back allow the 2x1 brick to fit around the back of the smaller craft. I can also recall numerous helmets and hairpieces (Qui-Gon's hairpiece from 1999 was the worst) which did not stay attached to the stud on the top of heads. Now, given modern CAD software and greater precision in computer-mechanized manufactory processes the fact that there are still problems with piece quality points not to a greater failure in production but rather in design. I've really noticed how the blocks FEEL different. Biggest failure I have is a boatload of battle droids that won't stand up. The joint between torso and legs is so sloppy they fall over. They weren't like that when I got them, and they have been display pieces, so they aren't worn out from play. My son received a lot of LEGO Star Wars for Christmas. About a week later we noticed one set of droid legs that had this problem. I contacted Customer Service and they sent me a replacement right away, and so far that's the only one that has had that problem. When I contacted them, I told them that I can't say whether it was like that out of the box or whether it happened from play, but either way if the piece deforms after 1 week that is a problem (and since that is the only one out of 20+ that has done that in 4 months, I think there was a fault in the piece not in the way my child was playing with it. I've recently come back to Lego after a twenty-one year gap (thanks son). I am shocked by the poor quality and feel of many bricks. I built a wall and was unimpressed by the gaps and ridges and shadows thrown by the different-sized and misaligned pieces. The feel of the plastic is horrible - it reminds me of the cheap Lego imitators of the 1980s. The only saving grace is the awesome designs currently available. I'm not sure how many battle droids of mine were affected, too busy to go count (been on paternity leave myself, for 9 weeks, only 5 paid, so returning to work tomorrow, exhausted). I'd guess 10 or so, maybe more. I see a lot of mold marks. I have also noticed translucent pieces that have swirly patterns in them, cloudiness. Even solid colored pieces. My R2-Q2 minifig from 7915 Imperial V-Wing has several visible flaws. Looks crappy. Fortunately it is the back side. Do we have any feedback from the Lego Ambassadors on the issue of declining quality? Maybe working through them is the best strategy. I was given several sets of Legos, when I was a child, from 1984 through 1991. Eventually, all those pieces were lost or given away, when I stopped playing with Legos in 1994. I started collecting them again in earnest, beginning in October of 2010. I had not noticed any issues with their quality, but then again, I had no older pieces to compare them. A couple weeks ago, my cousin told me I could have his old Legos (purchased between 1987 and 1991), that had been sitting in a box in his basement for nearly 20 years. Amazingly, most of the sets were about 98.5% complete, and the missing elements were common ones easily replaced by current sets and elements of the same shape, but different color. The treasure of the collection is a complete 6399 set that still works. But I digress, I noticed that even though these old pieces fit together fine, one could tell they were older. It's is hard to describe, but some of them just felt old. They went together in a stiff and spongy sort of way. I have had no problems with my current sets. My son did drop a helicopter and the propeller piece broke. However, this sort of thing happened to me as a child in the late 80s and early 90s. I noticed that there were some gaps in the walls of my modular buildings and that they do not feel completely flush. However, this seems negligible as all my new sets are holding up nicely. ^ I have a few thousand older pieces left over from my youth, including a few full sets. These older pieces really aren't nice to use any more - aside from the physical scars they have from years of being played with hard and often by a kid who loved LEGO and used it every day, the clutch has become tighter, and it can be hard to pull the bricks apart now, even standard bricks, let alone plates. I'm wondering if this is down to having thoroughly washed the older LEGO a few years back in water that was slightly too hot, or whether it's just down to changes in the bricks over time. I haven't had many issues with faulty pieces. Once one of those long ones with all the holes snapped in half during play, but I contacted Lego and it was replaced quickly and free of charge even though the set was a few years old. But I have had damaged/bent/missing instructions in more recent sets and this never happened when I was collecting as a child (and that was in the late 1990s and early 2000s). I also have recently missing pieces in brand new sets which had not happened to me before. Lego is great about dealing with these issues, I've found their customer service to be excellent and generally pretty fast, but it annoys me that I have to deal with such issues in the first place. It seems awfully strange that my many sets from when I was younger were problem free and now suddenly these things happen when I begin collecting. Quality must be going down and I am probably lucky not to have experienced more issues than I already have. ^^ I've had the same experience with missing pieces from newer sets vs the sets from when I was younger. I haven't had any quality issues so far, but I'm not too focused on that one. I noticed that I recently bought the 7261 Clone Turbo Tank from 2005 (The version with the normal Mace Windu) I was very happy to see that it said Component's made in Denmark and the Czech Republic. I'am a bit curious though after seeing newer set's from 2011 that say countries like Mexico and China mixed with Denmark, Czech Republic, Hungary, Germany, Switzerland, Poland, Sweden and Austria, I've even seen Malaysia, Hong Kong and Korea on some of the older set's. My issue is with the MMV - I'm not sure if it's an issue or not... the roof tiles all seem to be different. Some are very textured, some are textured with a smaller/finer texture and some have really smooth shiny bits on them. Is this how they're meant to be or it a fault? The first time I noticed anything was last night when I finally started putting together my Grand Emporium. The three "doors" in the revolving door piece would not hold the glass pieces in tightly at all. If you barely touch them they will come out. I will only display mine, but if I was going to play then that would be a real issue. Anyone else seen this on this set? I have the same door-glass piece combinations in other sets and they are always tight and good so I dont know if this is a problem just with this set or not. (been on paternity leave myself, for 9 weeks, only 5 paid, so returning to work tomorrow, exhausted). Can I get a job at your place? 5 weeks paid paternity leave!! I took 2 weeks holiday, otherwise I'd have been dropping to £115. Sorry for the digression, I couldn't let that pass without comment. I agree, the quality on your R2-Q2 is shocking. I haven't opened mine yet so don't know if it suffers from the same issue. A couple of years ago, when a bunch of the roof slope moulds were getting to the end of their useful life, Design Lab decided that it would be a good idea if all slopes (roof & curved) had a matching smooth look, and started making the new roof slope moulds with a smooth texture (it was also better for sticker adhesion); a short while after they had made the change, they decided it didn't work too well after all, and reversed the change, back to textured roof slopes. It does mean that there are a mixture of the different types in circulation, & in LEGO's brick store, and it's going to be a while until all the temporary smooth roof slopes stop popping up in sets. ^ The smooth roof slopes are absolutely hateful; thanks anyway for the info, @bluemoose - it's gratifying to know that the supply will eventually be exhausted and we'll be back to something decent. Hmmm... the only problem I can recall off hand with Legos as a kid were the transparent 1x1 plates used for lights on vehicles... those would crack and break. Plus the print jobs on the minifigure torsos like my police minis would rub off. I don't have that problem now days with the minis and the plastic used for the transparent pieces seems better. It could be honestly better plastic and with the minifigures, I'm more mindful of what will cause the print designs to rub or wear off. The other is/was with all my Pirate Flags, to the point I'd start gluing them to their poles. After some 20+ years, I've only found one white 1x1 brick that's cracked. Is it luck? I don't know. I've seen photos on Flicker where someone compared a Toy Story Alien made in Europe and with one made in China and there was indeed a noticable difference of quality, notitably with the print job. Thanks for the info guys. The roof tiles are really bugging me. I definitely like the textured ones more, but the ones that have half smooth and half texture are very annoying. Looking at the picture on the box, it appears that the set used for that also has the patches - if you see how the light shines off them...or maybe that's my imagination ! I found this forum because my #7913 Imperial speeder (which only has 85 pieces total) has 6 or 7 pieces with cracks in it. These are normal pieces too, like a 2x2 plate or a 1x2 brick. Very disappointing that this happens. These cracks appeared within just one week of owning it! I have only really noticed a colour difference in some recent yellow bricks. I would say this is probably due to slightly less pigment in the plastic or a slightly different yellow pigment being used in either the Chinese or Mexican ? factories. The variation is subtle but consistent, when the two yellows are side by side. The other production problem I have seen is a few air bubbles in some of the blue transluscent rods in the superheroes sets. ^ I have noticed small bubbles in just about every light saber blade / laser beam I have. ^^. Pretty certain this is on purpose. @Venunder you're not imagining it, there are two shades of the same yellow color I think. I know this from owning the older Lamborghini Gallardo #8169 and the current Cool Cruiser #5767. Older yellow is darker and deeper, almost mustard in color. The new yellow is more even and clean looking, like a light sun yellow. So I think there was a change to the yellow pigment mix while the color code didn't change. And yes, I have air bubbles in the few dozen lightsabers and in a variety of colors, so that is a common defect. In my Fire Brigade, I had 2 different color variations for the same brick. I don't know if I was just unlucky. I'm only just getting back into Lego. Have a few technics sets from the 2000s but mostly sets from the mid-70s/early 80s. - Bricks feel different. Not sure if they feel more flimsy, plasticky, or what. Just different. They sound different, too. - The surface on the smooth bricks isn't consistent. Kinda like part has been roughened up with sandpaper or something. As far as manufacturing in China is concerned, it's a mixed bag. It's necessary to be exact with specifications. Anything unspecified details will be at the discretion of the manufacturing plant and even then, regular inspections/increased QC would likely be required. The way I see it, though, is if Lego is this expensive today with offshore manufacturing, I'd hate to see how expensive it would be if it were produced exclusively onshore. Creator 4996 Beach House (2008) is a good example of quality gone somewhere. I'm not saying everything is bad, just the yellow bricks. The 1x4, 1x6, and 1x8 seem very cheap. They are certainly using less plastic, if you compare them against older bricks, you'll see the tubes (underside) are hollow, instead of solid. ^ Haven't they always been hollow? I remember Lego from the 80s and they had hollow holes in the bottom, unless of course my mind is playing tricks on me. ^ Where's @Istokg when you need him? I have both hollow and solid tube bricks in my collection, I'm not sure how new the hollow tubes are, or if they only manufacture these now, but I'm sure some of my childhood sets from the early 90s had the hollow tubes. Anything unspecified details will be at the discretion of the manufacturing plant and even then, regular inspections/increased QC would likely be required. I'm not sure of all the details, but from what I know, the Chinese manufacturing is pretty much identical to manufacturing elsewhere ... EXCEPT for the particular mixture of ABS plastic that's used. LEGO initially wanted to use their "standard" ABS mixture, but apparently were forced into using a different, but similar ABS that was produced within China. It's not clear if that was due to legal regulation, prohibitive costs, or some other factor, but we do know that the ABS is different. The molds themselves are (in many cases) the same molds that are used in Denmark. However, there are some duplicate molds that have been made for Chinese manufacturing. The conditions and QC are probably the same, but bear in mind that QC probably changed quite a lot in roughly 2006-2007 (before Chinese manufacturing was established). Essentially, Danish production had a very well defined and practiced supply and production chain that was always VERY well QC'd. And when Jorgen took over as CEO in late 2005, he intentionally made many changes to the production/supply chain that would make it more efficient, despite reductions in quality. Hence, one might guess that the Chinese QC process simply isn't as experienced as that in Denmark, despite (most likely) having very similar, if not identical procedures. I'm not sure when the trend began, but certainly there are references to the holes in hobbyist discussions online as early as 1997. So, at least since then! And this one you'll notice no holes.. So that is a difference but, I'm not sure when that changed. New sets have these but the quality seems fine. But the 4996 Creator set, the yellow bricks while they aren't bad, just feel cheap, and they don't have the clutch power of normal or current LEGO sets. Just something I noticed when building 4996 recently. You're probably thinking of a 2x brick?, where I'm talking about the 1x bricks..
^ Ahh, that makes sense. Yes, I'm thinking of 2x2, 2x4, 2x6, etc. bricks. Didn't even consider the 1x wide bricks. So, do you think I'm correct about the 80's, 2x bricks having holes, or was there ever a time when the 2x bricks were solid? You are correct about the 80's 2x bricks having holes, but they also had more plastic in them (walls), than current ones. I don't believe 2x brick tubes were ever solid.